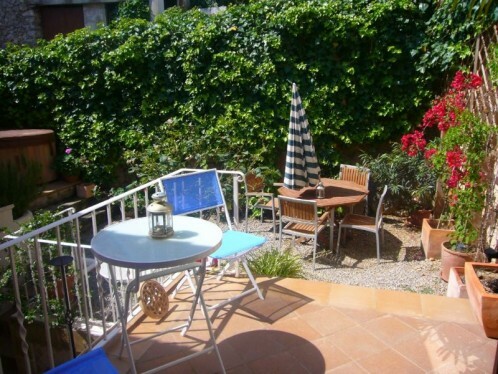 This beautiful townhouse is situated in a quiet area of the town centre. The whole house has recently been renovated taking particular care to preserve the traditional charm of Mallorcan townhouses. The layout includes 2 double bedrooms with en suite bathrooms, beautiful living_dining room with fireplace, fully fitted kitchen, terrace and patio_garden. Extras: Central heating, Extremely stylish interior. 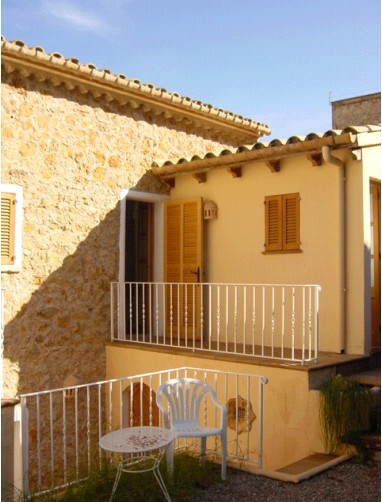 Outstandingly renovated townhouse in a delightful elevated situation in old Pollenca town high on the Calvario. Peaceful, quiet, with traditional stone features and beautiful light wooden beams throughout, the property is built on two levels. The main entrance (an original solid oak double door) on an extremely quiet one way street, leads into the large salon with dining area at on end and a comfortable seating area at the other. There is a pretty pine wood fully fitted kitchen with hand made tiles. The garden can be accessed from the main salon as well as the kitchen on the ground floor. Upstairs there is a small office space area with views over the town and mountains. Two spacious double bedrooms with bathrooms en suite also lead out onto two patios and the private walled garden. The house is an excellent example of an all year round living situation with an efficient oil fired central heating system. Parking is on the street (a small car can be parked outside the main entrance ) and the house is within easy walking distance to the town.